In Jerusalem, a city too often divided among religious and nationalist lines, unusual heartwarming encounters do take place from time to time. 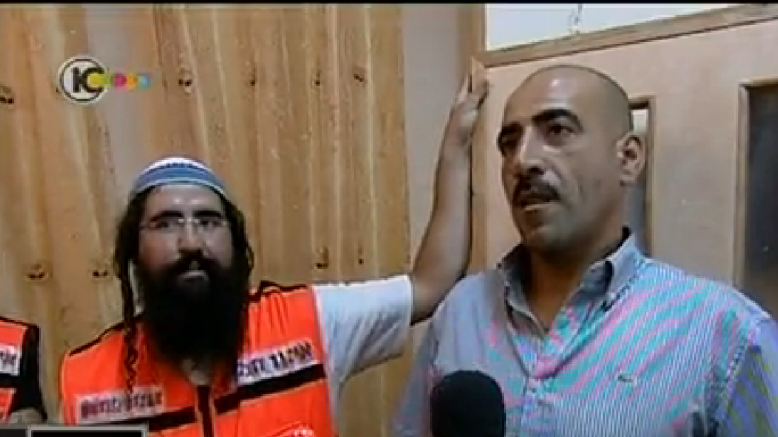 Haim Attias, a resident of the Mitzpe Yericho settlement and volunteer at the “United Hatzalah” emergency medical organization, and Haitham Azloni, an Arab resident of East Jerusalem, met Thursday for the first time since Attias saved Azloni’s life last week. It was the final days of Ramadan, and there had been some minor clashes between local Arabs and Israeli security forces in the area, and Attias happened to be nearby. A certified medic, he noticed Azloni lying on the ground and rushed to his assistance. After a long attempt to resuscitate him, Azloni’s heart rate was restored and stabilized. He woke up in a hospital several days later. “I’m hard to forget,” Attias noted, motioning with a smile to his big crocheted skullcap, sidelocks and beard. Azloni welcomed Attias to his home in the Old City’s Muslim Quarter with a hug and a traditional kiss on the cheek. They then sat together on a sofa, with Attias’s arm around the back of Azloni. 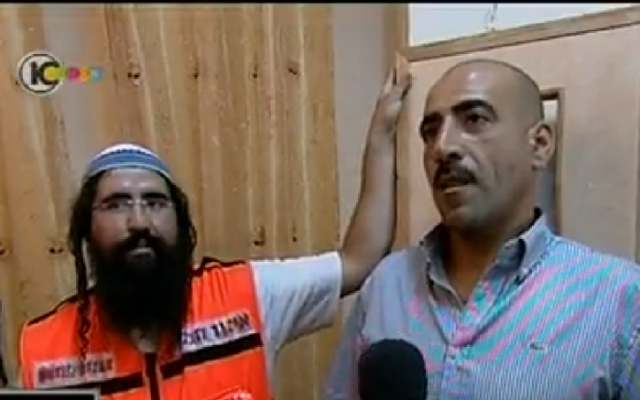 One of Azloni’s young children came to sit between them, and later high-fived the Jewish guest. The meeting was documented by Channel 10 News. “Thank him and thank God, or I would not be here,” Azloni said, gesturing at Attias. Other local Arabs interviewed in the report said Attias was well known and much liked by the Arab stallholders of the Damascus Gate area. Attias, who described himself as a former rebellious “hilltop youth,” said that when it comes to helping others, nationalities and religious affiliation must never stand in the way. “When I arrive at a scene, I don’t think about politics; all I think about is saving lives,” said Attias, smiling broadly. “It’s not a matter of peace or no peace. I’m certain that this is what God expects from me,” he said.